Two cousins and an aunt of Lyle and Erik Menendez have watched the "Law and Order True Crime" series of what allegedly happened inside a Beverly Hills mansion. "It’s very true," said Kitty Menendez sister, Joan Vandermolen. 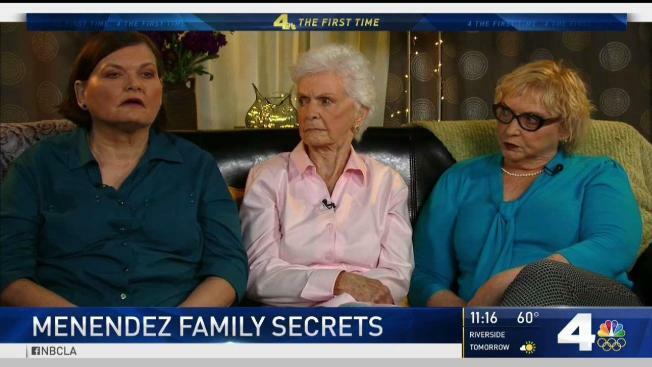 The three tell NBC4 that the show merely scratched the surface. "Finally they are starting to talk about the truth," said Diane Hernandez, Erik and Lyle Menendez's cousin. When they learned Kitty and Jose were murdered none of them suspected Lyle and Erik. But these three women have no doubt the brothers feared for their lives. "You need to pay attention to your kids," Vandermolen said. "My sister could have protected her kids. That was her job." Vandermolen says her little sister was a vivacious girl from the Midwest who married a monster. "I want the world to know what this man was like. What he did to his family," Vandermolen said. The Beverly Hills police department says there was no concrete evidence of sexual abuse on North Elm Drive, but the Andersens are convinced the red flags were there when they visited. Whenever Jose was with one of his boys, especially Erik, you were not allowed to go onto that floor. No one, including Kitty," said Hernandez. "You didn’t question Jose. He was intimidating." Just accepted to UCLA, Erik had apparently been told by his father he could live on campus, but would have to spend several nights a week at home. "Lyle told me in 1976 that he and his dad were touching each other. I went to get Kitty upstairs and then she came directly back downstairs," said Hernandez. "She took him by the arm and never said another word about it." NBC4's Robert Kovacik asked Vandermolen if she believes Kitty molested her sons. "My first inclination is to say, 'No I don’t believe she did.' Then I think how could I believe she did all this other stuff and let them be beaten and abused," said Vandermolen. All three family members are still unforgiving towards Kitty Menendez for what they believed happened to Erik and Lyle. When asked if they forgive Erik and Lyle for murdering Jose and Kitty, with certainty, Vandermolen, Copley and Hernandez said "yes, absolutely."